Just ten months after Brian Froud moved to New York to work on The Dark Crystal, he and Jim were ready to put some prototype characters in front of the camera. 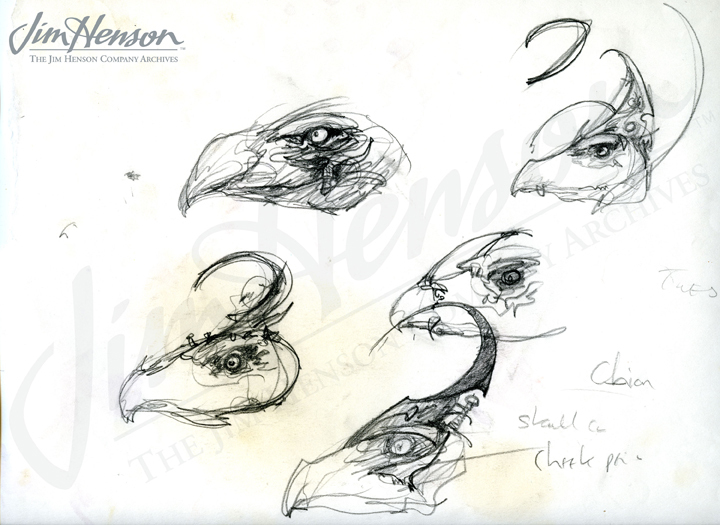 Jim was eager to see how Jen, Kira, the Mystics and some of the other creatures that were in development would look in the natural world. They carted them up to Bedford, NY in leafy Westchester County where Jim and his family lived. On the large, wooded property around the house, Jen and Kira conversed and small creatures peeped out from the underbrush. The slow moving Mystics lumbered through the trees, providing a hint at what the film would look like. While Jim got an immediate sense for his characters in this setting, he would eventually shoot in a studio rather than outdoors. For the film, Jim wasn’t content to use North American flora and fauna for his backdrop – he wanted to create his own world. To that end, every tree, plant and rock that decorated the set in the film was designed and built in Jim’s workshop. Jim did another test in the New York studio the following April, and by the summer, the team had moved to London. A third test in December gave Jim a good sense for how things were progressing. In January 1980, Jim shot various versions of Skeksis heads to see how they looked. He hired cinematographer Ossie Morris at the end of the month, and Morris organized the next round of on-camera tests, as much to see how the characters were looking as to check out what equipment would work best to translate Jim’s vision to the screen. See the October 17, 1978 test footage and learn about a later test. Early Brian Froud design for The Dark Crystal. 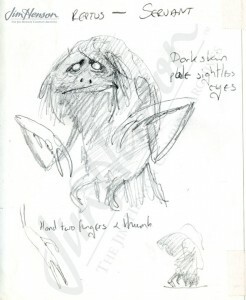 Early Skekis design by Brian Froud for The Dark Crystal. This entry was posted in 10-October '78, 1978, Dark Crystal and tagged Jen, Kira, London, Ossie Morris. Bookmark the permalink.